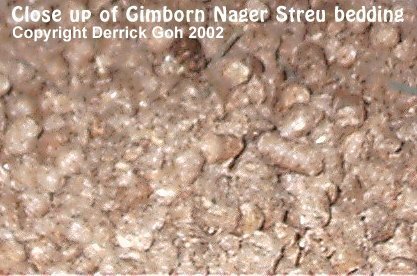 Gimborn Nager Streu is the only straw pellet in Singapore. Its made from wheat straw which is pelleted. Thanks to Dorothy for bringing this product to my attention & also providing the pic below. She tells me it breaks down into powder when wet just like wood pellets. The concern of this powder causing eye or nose irritation leads me to not recommend this product. Straw pellets are fine when used as litter in the litter tray, but I don't recommend using it as bedding, even if a very generous amount of hay or straw is placed on top of it. This is 'cos cavies tend to dig so despite the hay, they might still reach the powder which I feel is not good. Gimborn's disributor in Singapore is Advance Pet Products & you can email them at alicechan@pacific.net.sg. The contact persons are Mrs Alice Chan & Mr Alaric Choo. Quite rare. Difficult to find.